FOB PriceUSD 15.0-16.0/Piece ModelMF-Y4-M1 Certification CE, ROHS, FCC CapableMSDS,UN38.3,KCC Min.Order1000 Brand NameMOPO Brief Description*LED fast charing power pack with digital display. *Big capacity power pack sumsung cell battery power bank. *Fast input charger power bank . Nowadays,smart phone have clearly transformed the lives of many across the world and it is more and more popular during the last 5 years.The function of smart phone is more and more innovattive and the screen is bigger and bigger,but the capacity of the smart phone battery still can not meet the demand of daily use. 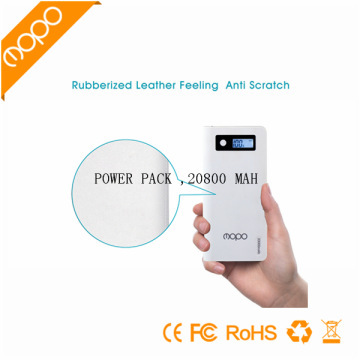 It is pleasure that the appearance of the power bank help us to solve the problem.To meet the increasing demand for power bank or portable battery charger,we join the bankwagon by releasing our new power bank MF-Y4 which is a big capacity power bank with high quallity battery 20800mAh and three USB output for charging from 5V/1A to 5V/4.8A maximum.It comes with a LED torch light and LCD sreen to show the remaining power and charging status. fashion & delicate design LCD screen. high capacity & Dual usb output ports charge two devices at the same time. multiple safety protection system to ensure devices safety. Use USB cable with micro USB connector to connect an adapter or computer to charge the power bank. The LCD screen displays 100% then it means the power bannk is fully charged. 1. Connect USB cable to the power bank. 3. When the connection is OK, Keep pressing the button for 3 seconds, the LCD screen on the power bank is bright,that means it’s charging your device. 5. When the device is fully charged, disconnect it with the power bank, keep pressing the button for 3 seconds and the LCD is turned off. The remaining power of the power bank is displayed directly on the LCD screen, you can see the percentage number which indicates how much the power is still remained, whether does it need to recharge or not. 1. Shipping way: UPS,DHL, EMS, TNT, China POST, Hongkong Post, customer can choose the shipping way by themselves. 2. Before shipping we will pack the goods well in case for damage and for the shipping time depends on which shipping way you choose and the courier company and local customs, duties, thank you for your understanding in advance. 1. Payment by TT/ L/C, Western Union will be acceptable. 2. Please note: The price is not including your bank charging fee. 3. Before you make payment, please make sure for everything for the products you are going to buy. (Packing, color, logo etc). Welcome to our booth at Dubai . 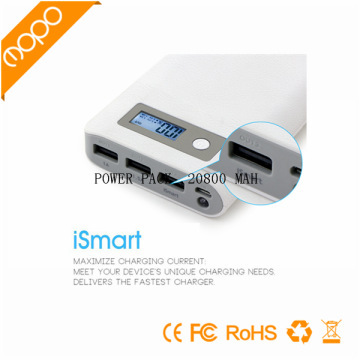 There are others models for your options,like high capacity ,QC charger,wireless charger,solar power bank ,card size power bank etc. Depend on the order quantity ,usually ,lead time need about 12-15 days. we will delivery the samples after we receive the payment.The payment should inclde the freight cost. We can recommend the forwarder to you ,FOB shenzhen or Hongkong.By air or by sea Ok ,we have MSDS ,UN38.3 certificate .Our company has the right to import and export ,can do customs declaration.